Hey guys, Corvus here, hijacking one of Godfrey's usual series to take a quick peek at something he and I have been interested in since GenCon: the new Eisenkern models from DreamForge Games. After the stir their Kickstarter caused, we felt compelled to check them out and take a look at their models firsthand. Most people may have kicked in for their titans, but after visiting the booth, I could only think about their infantry. So, join me as I crack open their 20 man squad and see if it was worth it. First and foremost, the reason I was interested in the infantry was because of my ever-recurring idea to do Battletech Tau, and Fire Warriors aren't quite human enough to be soldiers from that universe, and guardsmen already have their own codex. Since I'm such a stickler for WYSIWYG, neither of these options seemed to make too much sense. Enter the stormtroopers. Humanoid, armored, wearing helmets with full face masks (I hate painting flesh), and possessed of a distinct aesthetic not belonging to an existing army. I was stoked. After poking around a little on eBay, I finally came across a deal I couldn't refuse on the 20 man kit. So I caved in and scooped one up. When I said a deal I couldn't refuse, I got these guys for about $1.50 a model. That's half the price of a tactical marine ($3, yes you can totally get the new ones for that), so I was somewhere between excited and skeptical. $1.50 a model makes it much more feasible to field a ton of the guys for Guard, Henchmen, or Fire Warrior counts as (never mind the savings on Sisters), but I wondered what they must have skimped out on to get that price. Yes, that assumes that GW is pricing their kits "fairly", but after getting one of the new Tactical kits for Christmas, I can honestly say that it is a very impressive kit. The bits are nice and varied, there's the choice of any special weapons, combis, power weapons/fist or pistols, and the 5th edition mainstay missile launcher. It still needs the devastator kit for other heavy weapon options, but that box comes with so many extras that I'm alright with that. Holding the box in my hands, I was conflicted. The box art was obviously CG'd, but it definitely gave the models more context than GW's current packaging. So I cut the security seal and popped open the box. The first thing I was impressed with was how well the sprues were compacted and interlaced. They've got some pegs and notches molded into them to help keep them from rattling around in transit. Smart. From there, I looked at the instructions and I could almost feel my eyes bleed. I'm sure we all remember GW's "old" instructions. No part numbers, just a few dotted lines and pictures. The weapons weren't even labelled (That'll teach you to buy models without a codex!). This is about on that level. The parts are numbered (barely), and the instructions kind of color code which guns go to which arm sets. They're not illegible, but adopting GW's new scheme of "76a goes to 76b for a complete set of arms" would have seemed like a much more logical move than what DreamForge took. The sprues themselves were packed more tightly than the previous generation Tactical box, but the didn't live up to the new SM boxes by any means, especially not in volume of excess bits, or variety of bits either. Every torso is exactly the same, and there's only two types of helmets, eight of one and two of another. The legs have varied stances, but in some ways they're a little too varied. Half of the guys are in aggressive advancing poses, the other half seem to be holding up and digging in at a set position. This isn't necessarily a problem for me as that gives me two cohesive ten man squads, but for those who might buy the ten man box, it could be bothersome. Other than the legs though, there's 3 ways to position the arms and that's it. You're going to run out of unique looking dudes very quickly. Good if you like your grunts looking like grunts, bad if you want models with real character. Knife in hand and instructions at the ready, I dove into the kit. Bad move. The plastic is hard and brittle, leaving me worried about every cut I made with my knife. I'll admit to unsafe modelling practices with GW plastic. I pick it up and hold it in my hands and cut it, the plastic is soft, cuts nice, and, most importantly, cuts consistently. Not so here. Most parts are held in by one, maybe two points of contact. Meaning those points have to be meatier to hold on to their pieces. Combine this with the hard brittle plastic, and you've got a recipe for disaster. What's further disappointing about the hardness of the plastic is that though it holds some lines and details well, others come out muddied. It's hard to say if this is the fault of the plastic or the fault of the sculpt, but either way it's really annoying. 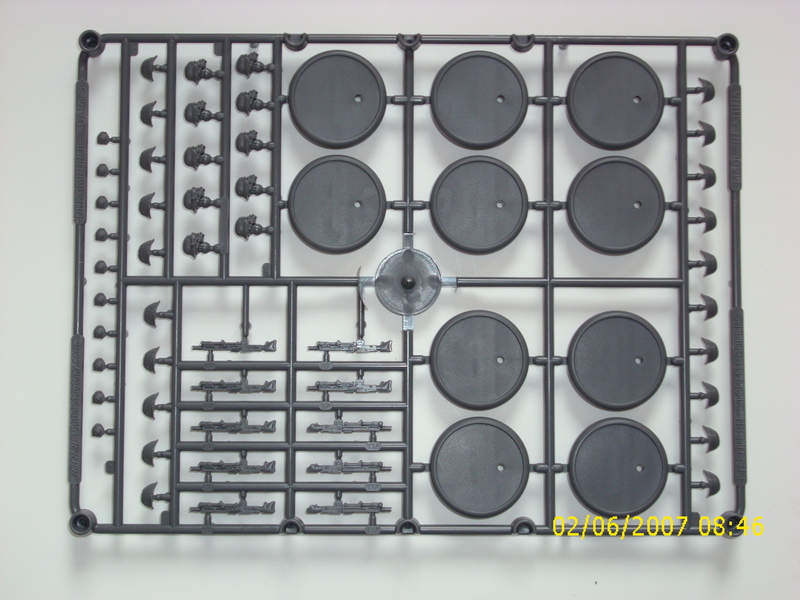 You'll also see included on the sprues are the bases the models are built for: "peg and hole" 30 mm bases. After you trim the peg, they have a little trouble staying upright, but they do fill out a 25 mm base fairly well. They're about as tall as a Space Marine or Guardsmen, which means they work well in terms of "game balance" for purposes of LoS and cover. They're lean, and moderately armored, meaning they can work well for just about any T3 model that's not in power armor (sorry, no sisters replacements here). 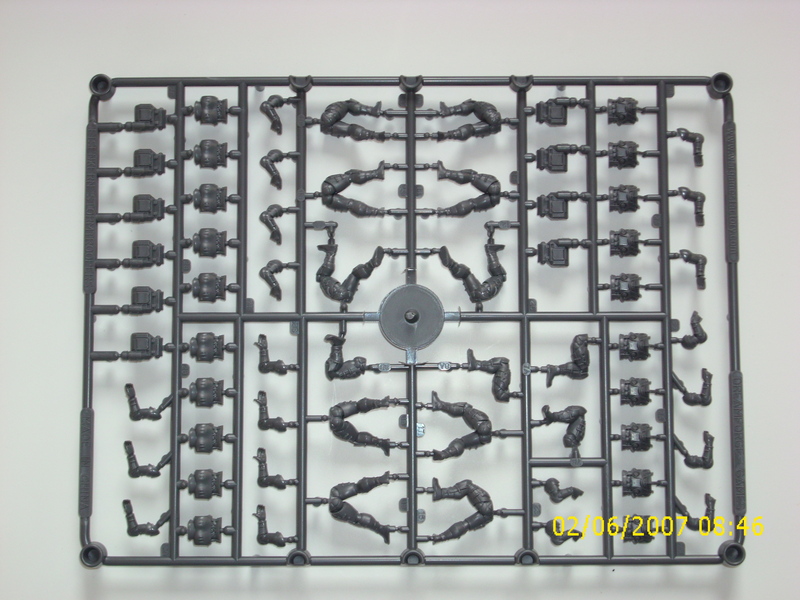 Guard players may be put off by lack of on sprue options though, as there's no real stand ins for your melta, plasma, or flamer bits. The kit comes with a half frame containing a few grenade launchers, SMGs, and RPGs, but there's no real way to get a sergeant to stand out without distinctive paint. DFG does make heavy weapons teams, but given my intended use, I have yet to pursue that option. And then there's the big fascist elephant in the room. The styling. 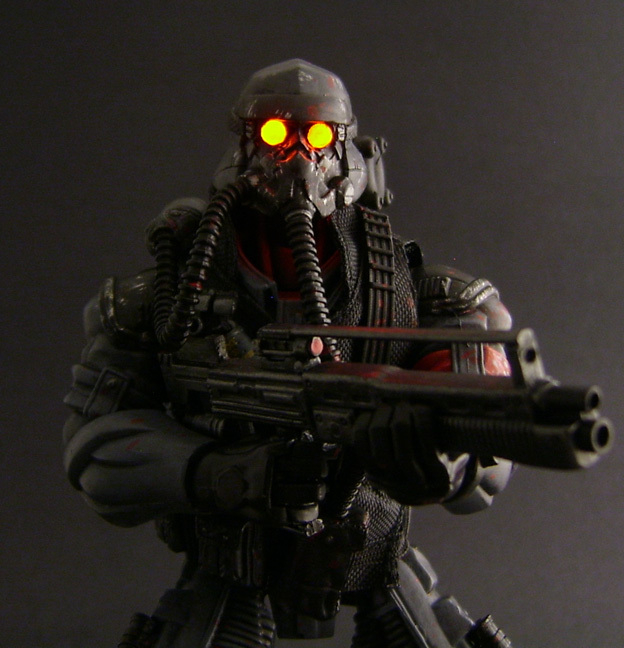 These models are dead ringers for... the Helghast, from the popular Killzone franchise. I'm not entirely sure how DFG is avoiding getting sued by Guerrilla Games, but evidently they are. Ultimately, I'm very torn on the kit. I really want to like it, especially since it stood to give GW some competition. 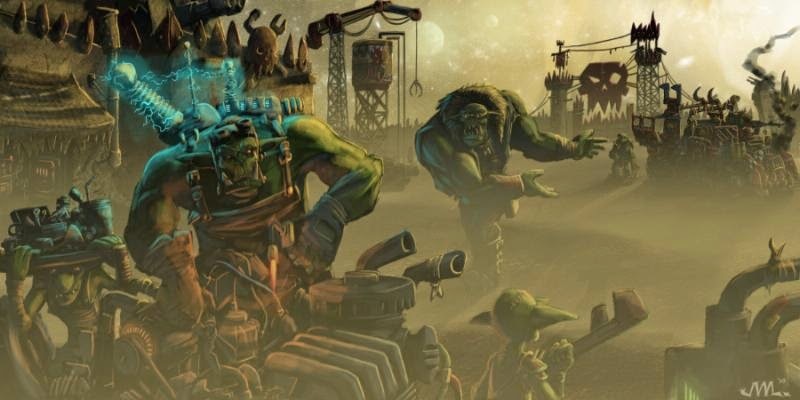 However, this just isn't as nice as what GW has spoiled us with. It isn't. There's not really any two ways about it. But, that said, there's definitely some attractive options for Tau or Guard here, specifically if you like the aesthetic, or just loved the Killzone franchise. Outside of that though, it's very very hard for me to recommend the kit to the passing hobbyist or even enthusiast. The plastic is just that much of a chore to cope with, and the lack of variety really is that disappointing. For gamers on a budget, these points may not matter so much, but the consideration is out there that in this instance, you get what you pay for. I can't speak to their titans, but I'm personally left wondering where we'll see DFG go, should they be able to stick around.